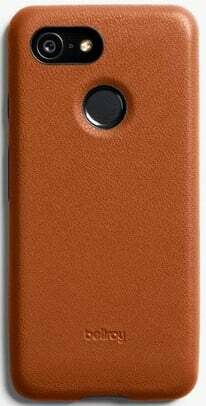 A gorgeous leather case that adds a touch of style and texture to your otherwise cold and smooth phone. Some people buy cases purely for protection. They want to keep their phone safe from scrapes and drops for the lowest amount of money possible. Others want a case that enhances a phone and is more pleasing to hold than the metal-and-glass sandwiches all flagships have turned into — the Bellroy leather case for the Pixel 3 is a case for those people. There are cheaper and thinner cases, but that's not what this case is all about. The Bellroy leather case feels amazing, with a supple softness and texture you don't get with anything but natural leather. It also retains your phone's full functionality, with big cutouts and an acceptable thickness. It's worth the money for anyone who wants to elevate their case game. Bellroy knows how to do leather — and it makes this case luxurious. I won't say I've used an extensive number of leather phone cases, but the Bellroy is absolutely the best feeling of any I've touched. The leather has a subtle texture to it that just feels right, and it's on a backing with just a little bit of thickness and cushion that doesn't feel like it's simply glued to a piece of hard plastic like so many cheap "leather" cases out there. When you look at what Bellroy does, it all makes sense — the company makes leather goods across a variety of categories, from wallets to bags and of course accessories for electronics. The leather is tanned and dyed to "age gracefully," which is exactly what you want from a quality piece of leather. The whole point of leather is that it slowly adapts to its environment; you shouldn't want it to stay pristine and featureless over time, nor do you want it to be dry and rough with some sort of coating. That doesn't mean that the Bellroy case is going to fall apart, though — the company backs up its leather cases with a three-year warranty, which is undoubtedly something you're paying a little extra for in the $45 (Pixel 3) or $50 (Pixel 3 XL) price. There's no trade-off of functionality for form. I went with perhaps the most standard natural-looking color, "caramel," but Bellroy has five other tones ranging from blue and black up to coral and a limited-edition "not pink" to match the Pixel 3's fun color option. The lighter colors bring out the texture of the material, and I particularly enjoy how the caramel is set off by the pops of white from my Pixel 3 XL's back. The peek-a-boo looks come from sizable cutouts for the camera sensors, fingerprint sensor and USB-C port, so you won't feel encumbered trying to use the phone. The thickness of the case is about on par with the fabric Google case, which is my other current favorite. All of the leather edges are accented by a strong black rubber edge, which complements the color but are also functionally necessary to keep the leather from getting roughed up. The black edge around the front is high enough to safely place the phone face-down on a flat surface, and the edges around the other cutouts make sure they won't fray. There aren't cutouts for the side buttons, but the material is stamped out to give you a nice buildup to press them — they're a little stiff right now, but I suspect those will loosen up over time. The Bellroy leather case for the Pixel 3 (or any phone, really is a luxurious way to protect your phone — it looks wonderful and feels just as nice. The only complaint you can have is that at $45-50 it's twice as much as most people want to pay for a case. Sure it's not the cheapest or the slimmest, but that's not the point of the Bellroy leather case. This is what it costs to get something this nice — and it is, indeed, nice. Treat your phone, and your hands, to something they all deserve.